By 1880, four years after Alex Mentry brought in California's first commercially successful oil well deep in Pico Canyon, the unskilled labor of the indigenous vaqueros was insufficient for the task at hand. Mentry started importing experienced drillers from Pennsylvania, some of whom were married, some of whom weren't. Those who weren't married lived in one of two bunkhouses in the canyon. 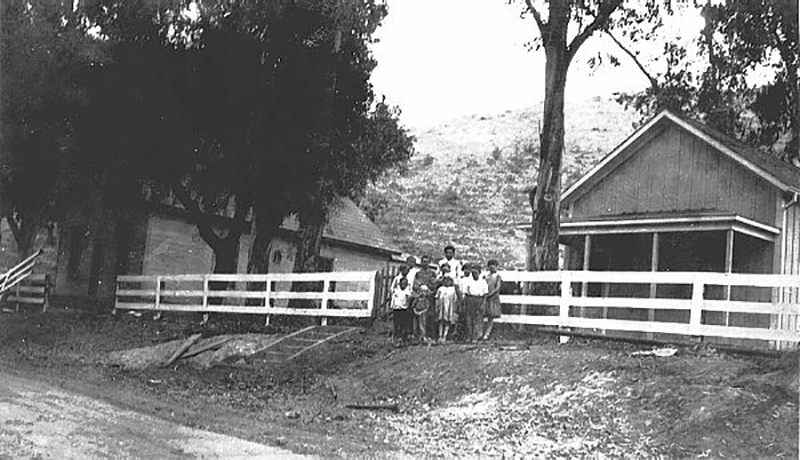 Those who had families sent their children to school in Newhall until 1885, when the need was such that a school district was formed and a little one-room school house built on the north side of Pico Road in what was now known as Mentryville. The school (shown at right) and the school district were named for future U.S. Senator Charles N. Felton, then-president and chief financial backer of the Pacific Coast Oil Company, which had been formed by oil man D.G. Scofield in 1879 to replace Scofield's earlier California Star Oil Works. Roughly 22 families (not counting bachelors) lived in Mentryville through the early 1900s. They sent their children to the Felton School until 1932, when the school-age population dipped below the minimum-required five pupils. The Newhall School District absorbed the area in the following year. For years, Chester Johnson would gather his trio or quartet and the ladies would provide refreshments (for the Saturday night dances). All joined in the dance. The school house originally was used for the dances, but too many people showed up (so the dance hall was built). . . . Pico dances were welcomed as a change of pace by the folks down at Newhall -- if they were lucky enough to get an invitation. The Felton School and the dance hall were cream-colored when this c. 1920s photograph was taken. The school was spruced up and painted red by Mentryville residents Frenchy and Carol Lagasse in 1977 for a centennial celebration. The dance hall no longer stands. For more information read The Story of Mentryville by Leon Worden.